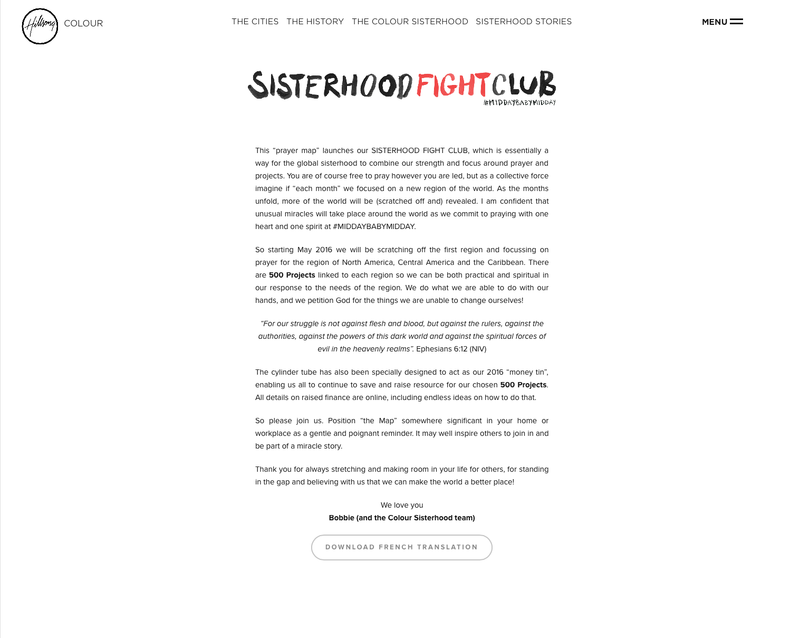 It came to our attention that earlier in the year, Hillsong launched (for Bobbie) a “SISTERHOOD FIGHT CLUB” scratch and pray poster (or prayermap). Scratch a region to find out what you need to pray for. “This “prayer map” launches our SISTERHOOD FIGHT CLUB, which is essentially a way for the global sisterhood to combine our strength and focus around prayer and projects. You are of course free to pray however you are led, but as a collective force imagine if “each month” we focused on a new region of the world. As the months unfold, more of the world will be (scratched off and) revealed. I am confident that unusual miracles will take place around the world as we commit to praying with one heart and one spirit at #MIDDAYBABYMIDDAY. So starting May 2016 we will be scratching off the first region and focussing on prayer for the region of North America, Central America and the Caribbean. There are 500 Projects linked to each region so we can be both practical and spiritual in our response to the needs of the region. We do what we are able to do with our hands, and we petition God for the things we are unable to change ourselves! The cylinder tube has also been specially designed to act as our 2016 “money tin”, enabling us all to continue to save and raise resource for our chosen 500 Projects. All details on raised finance are online, including endless ideas on how to do that. So please join us. Position “the Map” somewhere significant in your home or workplace as a gentle and poignant reminder. It may well inspire others to join in and be part of a miracle story. Thank you for always stretching and making room in your life for others, for standing in the gap and believing with us that we can make the world a better place! There is nothing wrong with praying. We are encouraged to do so in the Scriptures. However, the doctrine Bobbie Houston is pushing above is the Spiritual Warfare doctrine taught in the New Apostolic Reformation cult. It’s just another gimmick to make even more money! It’s also limiting Gods power to answer prayer only if you follow the instructions and only if it’s united prayer will God even hear! God is especially powerless to act unless ‘Fight Club’ do their job! I wonder, do you win a prize if you scratch 3 prayers that are the same? That will only happen if you faithfully tithe your entire life. As usual, there is money involved.